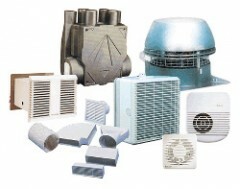 Domestic ventilation applications can be some of the most challenging and the range of equipment available is extensive. Our long experience, partnerships and product knowledge ensures that we always offer our clinets the best value and most suitable products for each and every application. Alan Williams & Co is happy to consult with builders, housing associations, installers or DIY homeowners directly, offering a diverse range of products which are tailored to match most domestic project applications. Our solutions are discrete and unobtrusive, ensuring maximum performance in a quiet and energy-efficient manner.